Cafe Nineteen01924 375773work Tea/Coffee ShopAt Café 19, they serve a wide range of homemade meals as well as panni's, sandwiches, soups and breakfasts. Also included is a large healthy eating menu, with meals that are cooked using the best meats and fresh vegetables. One of their best sellers are the Healthy Chicken Kebabs - Grilled chicken Tikka served on a bed of Spicy Rice with salad. 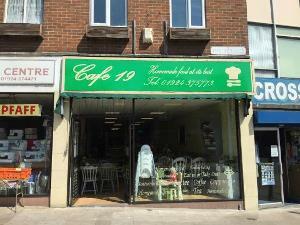 Café 19 use local based independent suppliers which they are proud to support. At Café 19, they serve a wide range of homemade meals as well as panni's, sandwiches, soups and breakfasts. The café is family run with a very lively and friendly atmosphere. It is a happy place to eat, with a shabby décor and hand picked furniture and they love to get to know their customers who visit.